Cape Girardeau Dental Care - Making a Great First "Impression"
"Making a Great First Impression - Without the Goop or Gag!" Call today to setup your FREE Consultation and FREE Smile Simulation! See just how beautiful your smile can be! Let's face it - it's not easy to stop your gag reflex when getting a goop-filled dental impression made! Thankfully, old-school impressions are no longer the only option. With state-of-the-art technology and the progressive dentist office that's providing your treatment, making a great-and comfortable-first impression with the iTero scanner has never been easier. The iTero scanner allows your dentist to take a digital impression-a highly accurate, digital 3D image of the individual characteristics of your tooth surfaces and gum tissue. The iTero scanner is all about keeping your comfortable while delivering precise imagery, without the putty filled impression tray that makes you gag! Not only is it more comfortable, but taking a digital scan for your new crown, bridge, or Invisalign aligners is quick, which allows you to spend less time at the dentist's office and more time enjoying your new smile! The Wand - Your dentist uses the iTero to capture images of your tooth surfaces and gum tissue. The Scan - You and your dentist can follow the scanning progress on the computer screen. The 3D Model - The completed scan is sent to the computer, which builds a 3D model of your tooth surfaces and gum tissue. It's COMFORTABLE! No gooey mess associated with impression materials! You can breathe and swallow naturally during the digital 3D scan! No unpleasant taste! It's SAFE! No exposure to radation! A laser is used to generate the images! It's ACCURATE! It allows a more precise fit of crowns, bridges, veneers, and Invisalign! 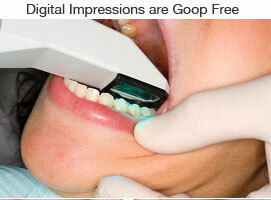 It eliminates the need to retake impressions multiple times! It's FAST! 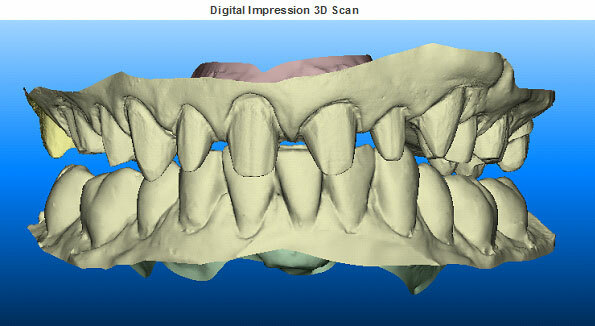 You can view 3D scans onscreen with your dentist immediately! Digital impressions taken for restorative purposes are complete in approximately 3 to 5 minutes!